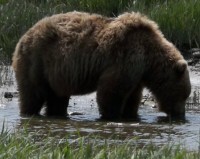 Considering a bear-viewing adventure in 2013? Check out what the Great Bear Foundation has to offer. Our bear ecology field courses give you the opportunity to observe bears and other wildlife, with minimal impact on the animals and their habitat. Meanwhile, you’ll learn about the big-picture context for the animals you observe–their ecological roles, cultural significance, threats and conservation issues, and how to safely observe them without threatening their well-being or their habitat. This year, we’ll be offering two field courses at Churchill, on Hudson Bay in Canada. In addition to our annual Polar Bear Ecology Field Course in November, you’ll also have the rare opportunity to travel with us to Hudson Bay in August, for Berries, Belugas, and Bears, our summer arctic ecology trip. This trip is timed for the best opportunities to see beluga whales, in addition to expeditions to pick berries, explore the tundra, look for fossils on the beach, and explore areas that are not accessible to us in the snowy fall and winter months. There may be opportunities to view and photograph the aurora, and, with some patience, we’ll likely find a few polar bears. However, if you really want to see polar bears, your best bet is to travel with us in November, when they congregate at Cape Churchill, waiting for first ice. In May, we will be expanding our operations to Alaska! Stay tuned for opportunities to view bears in Southeast Alaska! We’ll also be available for educational programming and custom wildlife-viewing expeditions in and around Haines, Alaska, southern Yukon, and northern British Columbia. Contact us for more information to book a wildlife expedition or educational program.